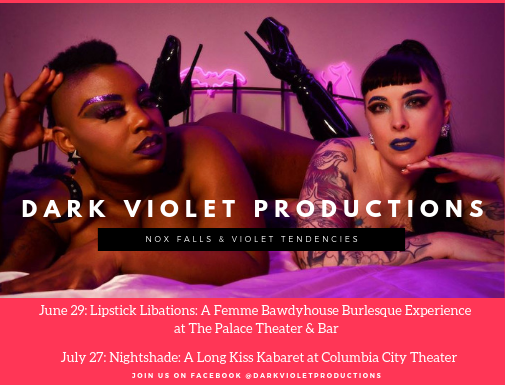 Dark Violet Productions is the Glam Noir Burlesque lovechild of Nox Falls and Violet Tendencies. Our aesthetic is sensual and raunchy, neon and ink black, diverse and electrifying! We are kicking off in style with a glam, queer, dirty, grindy excursion in celebrating of PRIDE with Lipstick Libations at The Palace Theater & Art Bar on June 29th 2019 – get tickets here for a Femme Bawdyhouse Burlesque Experience featuring Violet, Nox, Briq House, Seraphina Fiero, Mia Miravilla and Adra Boo! Then join us at Columbia City Theater on July 27th for Nightshade: A Long Kiss Kabaret for a brand new in-the-round burlesque experience featuring long-form acts in our historic Vaudeville space.